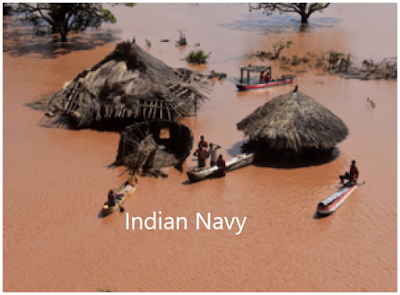 The ships of the First Training Squadron of the Indian Navy (Sujata, Sarathi and Shardul) are currently undertaking Humanitarian Assistance and Disaster Relief operations at Port Beira, Mozambique since 18 Mar 19. The ships were diverted from sea post Cyclone 'IDAI' hit the coast of Mozambique on 15 Mar 19 causing large scale destruction and loss of lives. Since arrival at Port Beira, the ships have rescued more than 150 survivors from Buzi area near Port Beira, which is cut off from the mainland. In addition two medical camps have been set up at Port Beira and Gaura-Gaurathe Island and Medical assistance has been provided to over 800 affected people from the local population. The Chetak helicopter of Indian Navy has undertaken a number of sorties in difficult conditions for evacuation of local personnel in coordination with local authorities and the UN Mission. The helo also undertook evacuation of 03 pregnant ladies, dropping of relief materiel (food and water) including 500 Kgs provided by World Food Programme. INS Shardul transferred 10 Tonnes of fresh water to a water bowser on jetty using submersible pumps. About 2 Tonnes of drinking water was also provided by INS Sujata in jerry cans to the Port authorities for relief camps. Community services are being undertaken by the ships crew at devastated locations like schools, churches, hospitals, orphanages in coordination with the local government officials. The ships have setup a Community Kitchen kept open 24x7 for all local populace including the workers at the port. A total of about 450 people have been provided hot meals. In addition, Media Personnel from BBC, TVM Mozambique and OXFDM visited onboard our Ships for witnessing the relief work being undertaken. The media team also visited the Medical camp site at the Port and were briefed about the various medical aid being provided by the ships.